TORQUE has indeed gone a long way since its early beginnings in 2008. From being the first local mobile brand to launch the most affordable mobile phones and tablets with superb features at par with those found in foreign brands, Torque’s status went up from the 10th up to 7th and then up to 5th for the past 3 years. Torque’s revenue has gone up to 150 percent compared to 2012. To celebrate its fifth year milestone, Torque beefed up its product lineup with more innovative smart phones and tablets that caters to Filipino mobile phone and tablet users. Torque is offering mobile handsets that go beyond calling and texting. Since Filipinos use their gadgets for for entertainment as well, Torque lets them enjoy videos and music made more affordable with D1c, D1e, D1i, D5i, DTV5, DTV15 Slim. All products are with dual-SIM capability, FM radio, camera with video recorder, multimedia player and expandable memory up to 32GB. DTV15 is even built with mobile TV, which is also available for i20 TV+WiFi and i80 TV+WiFi. Featuring a bigger screen for TV viewing, i20 and i80 are built with large and clear 2.8” and 3.5” screens, respectively, as dual SIM capability, camera with video recorder, and expandable memory up to 8GB. Connectivity will not be a problem with its seamless WiFi capability and Bluetooth/JAVA/GPRS/MMS feature. Torque has also ushered in a set of faster, more powerful, yet budget-friendly Android gadgets under the Droidz series: the Beat TV, Pop 3G, Play 3G, Active 3G, Stark 3G, Atom S, Space 3G, Avatar TV, Quad, Motion and Life HD. These models run at 1GHz Dual Core CPU, except for Quad, Motion and Life HD which features 1.2GHz quad-core. Customers can choose from 3.5” to 5.5” screens, depending on their lifestyle and preference. Each smartphone is built with a superior interface using the advanced Android 4.1 to 4.2 (Jelly Bean) OS, and comes with dual-SIM capability and dual cameras, except for Pop 3G and Active 3G which have 3MP rear camera. Other features include Wi-Fi/Bluetooth capability and microSD slot. Torque also launched an exciting array of products also under the DROIDZ series, with the same features as an expensive tablet, at a fraction of cost. These include Edge, Duo Slim, Duo, Duo TV, Drive Slim and Push+. All of these models run at 1.2GHz CPU with 4GB to 8GB ROM and 512 RAM. With 7.0” capacitive touchscreen. All DROIDZ tablet are equipped with dual cameras. The last two models – Drive Slim and Push+ – come with single SIM capability with call and text features. The Droidz Portal X, Mini D and Mini Q, which comes with capacitive touchscreen, sized 7” and 7.85”, were also launched. All models feature dual-SIM capability that has call and text features, powered by 1GHZ dual- and quad-core CPU with 4GB ROM and 512 RAM, except for Mini Q which runs at 4GB ROM and 1GB RAM. 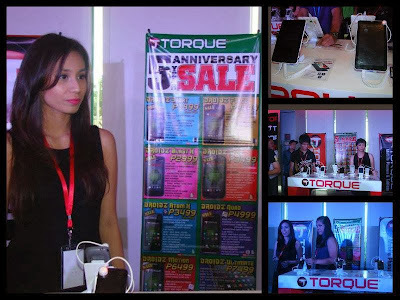 They also feature dual cameras, as well as mobile TV for the Droidz Portal X.
Torque ensures that in the months and years to come, it will provide the perfect combination of even more competitive products well-suited to the ever-changing requirements and preferences of the Filipino tech market.